An intriguing anthology where reality is transient and the puzzle box holds the key to the meaning of life. Archeology Professor Albert Mallory understands reality. He knows the way the world works. 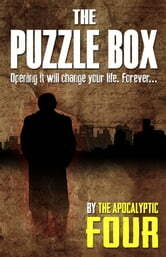 When he steals an ancient puzzle box to pay off gambling debts, he thinks the only mysterious thing about the artifact is how to get it open. But when a stranger appears at Albert’s door demanding to see the box, Albert is plunged into mysteries he never dreamt possible. Through the tales of four others who succeeded in opening the puzzle box — a musician named Warlock with a weakness for witches; photographer Autumn Bailey, with a strange link to the past; video store clerk Angela Matterly with those unworldly eyes; and a comic book illustrator called Sam, on a quest for his life — Albert learns that reality is transient and the way the world works is not found in text books. The Homeless Ghosts of Calcutta, A Collection.